The bed is solid. The wood is nice and grainy. The construction is solid and no creaking. The headboard is a little high so this bed wouldn’t fit well unless you put the headboard against a wall. The four stars are due to the really flimsy wood slats that came with it - my toddler broke one jumping and he’s only 33 lbs! Give your bedroom a Rustic chic look with the warmth of this Solid Wood Bed. This design features a Panel headboard and foot board made of 100% Solid Pine wood from Southern Brazil, this bed features a sturdy Platform Frame construction that can last for years. Featuring an Eco-friendly design, this bed has minimal impact on the environment as all wood comes from renewable forests. Fits Standard TWIN Size Mattresses (not included). Includes full set of slats, box spring is NOT required for twin size only. Dimensions 80.0 In. X 43.0 In. X 51.0 In. Purchased this for my 3 year old's first bed and bought the matching nightstand to go with it in grey. The textured wood makes this look and feel a lot more expensive than it really is. 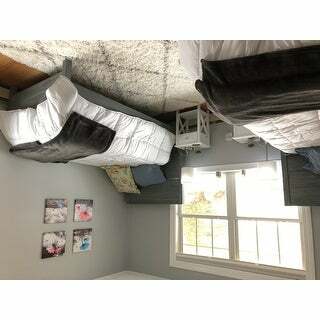 The slats allow for no box spring (one less purchase) and the twin bed fits great inside (however it does not fit snug- there are spaces when the twin mattress is placed inside but this allows for the comforter to be tucked in each side therefore the bed never moves). If you have a lightweight quilt instead of a comforter, the mattress seems like it would slide back and forth. When it arrived it was bad weather and was placed out in the snow- Overstock knew of the bad weather and contacted us right away to ensure the pieces were all ok-- that was great customer service! We had to build it all in a few days because of my sons birthday that weekend- unfortunately on one of the side panels of the bed, on the same piece there were 2 issues 1) a 3-4" piece of wood split and coming off- dangerous and if we ripped it off it would leave a raw wood mark along the bed and 2) there's a hole where the screw gets tightened behind at the end of the bed on the same panel straight through the wood maybe 2" hole. Honestly, to avoid problems, I would've left it, but it's the side you see when you walk into the room. Called Overstock for a replacement part, it got delivered. BUT the wood caps that you have to hit hard to cover the screws don't allow for you to remove them (easily). Called again, no solution other than to dissemble and return (but if we can dissemble, we'd be able to replace the one panel), or have it fixed locally aka my husband can rig it. We have requested a new hardware bag and will attempt to replace the panel this week. I love the bed, looks great in his room. But just our luck I guess with a bad panel causing all these problems. Overstock was great with the customer service though! This is a great quality bed for the price. Product was as described and shipment was fast. My son loves his new bed! I would definitely recommend this product. The bed was really nice and solid. It arrived on time and the quality was great. I'm going to change my review from 1 to 4. The bed is very sturdy but I would suggest two people moving it as there is no center support from keeping it from twisting. Putting it together was easy BUT the heads on the screws are very shallow making it more difficult to install. Instructions could be a bit more explicit and in writing. But if you take your time and you can have it done in 60-90 minutes. I love that there is 10 inches between the floor and side board, making under the bed storage easy to obtain. *note we had to send the first bed back because the holes and grommets were not drilled properly but the second unit was fine.) I would suggest this bed to others. Its a bed my grandson will be able to grow with. Overstock was very helpful when I asked they send a replacement! Grand daughters picked these for “their” bedroom. You’ll go crazy screwing then together unless you use your own power drill. The slats are a little on the flimsy side. I bought a box spring for added strength. Overstock’s price was *** less than other online stores. "What is the weight limit for this bed"
"Would twin xl mattress fit in it?Or only regular twin?" No this is only big enough for a regular twin. "How many slats does the twin come with and does it come with supports as well?" This bed comes with the set of 14 slats. It does not come with center supports.